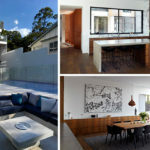 The home is split into three different levels, a main living/dining and kitchen level, a ‘floating box’ that houses bedrooms, and a lower level partially built into the ground. 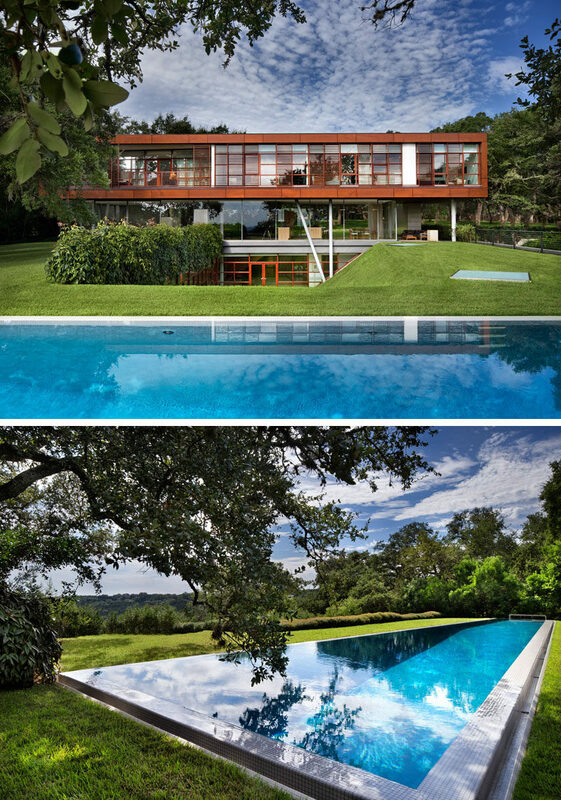 Skylights in the grass provide light to the rooms in the lower level, and the large swimming pool is the perfect place to cool off. 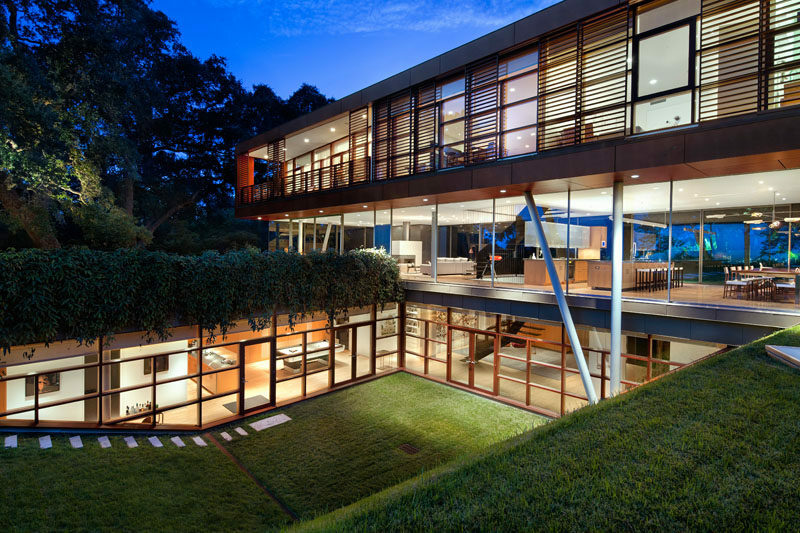 Glass walls surround the main living level of the home, and a covered outdoor patio with lounge is located off one end. 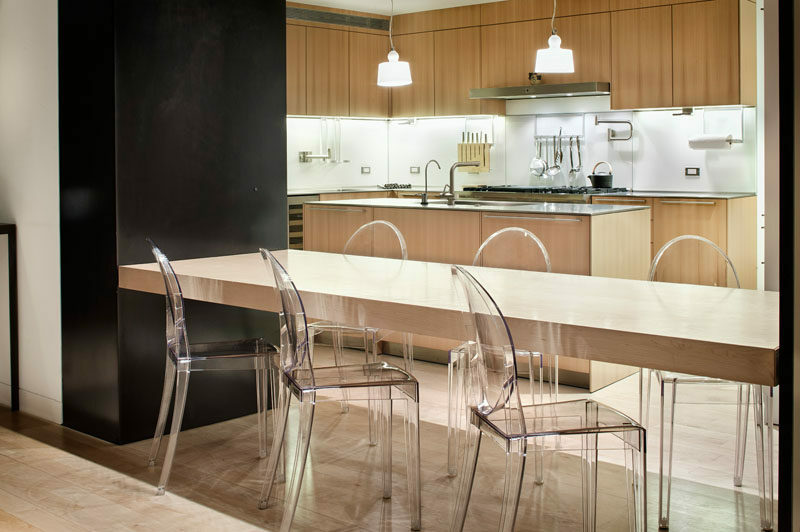 The kitchen with a long island separates the dining area from the stairs and living room. On the other side of the kitchen are the stairs leading to the other levels of the home and the living room, with a double-sided fireplace that can be enjoyed from two different sitting areas. 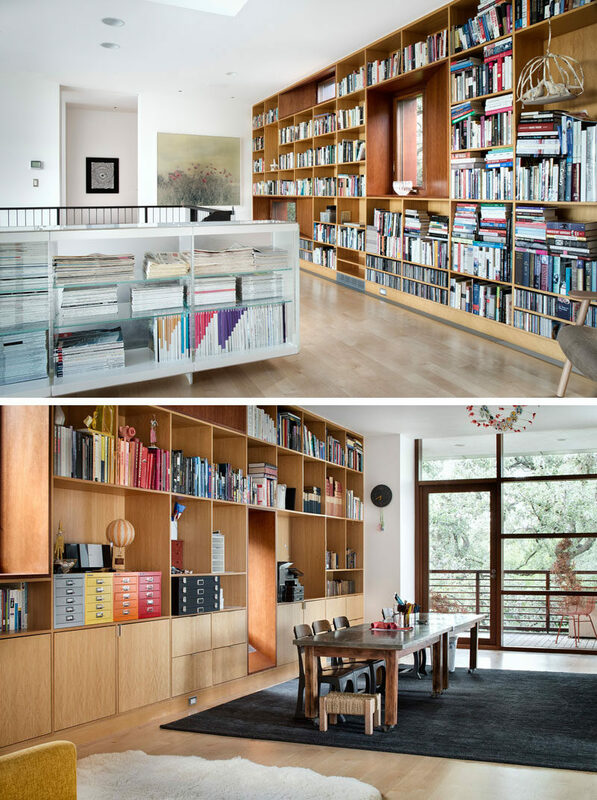 At the top of the stairs is a library with floor-to-ceiling built-in bookcases. 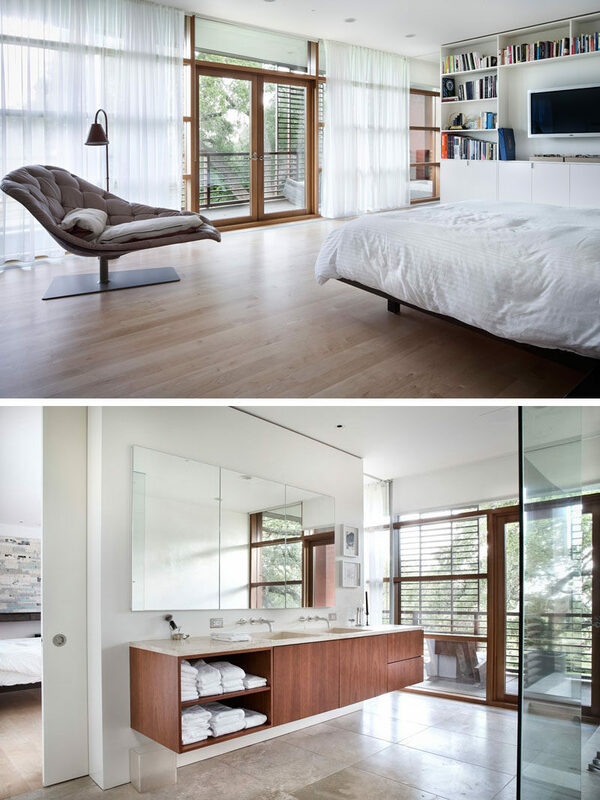 The bedrooms are also located on the upper level of the home, with the master bedroom and bathroom able to access a small private balcony. 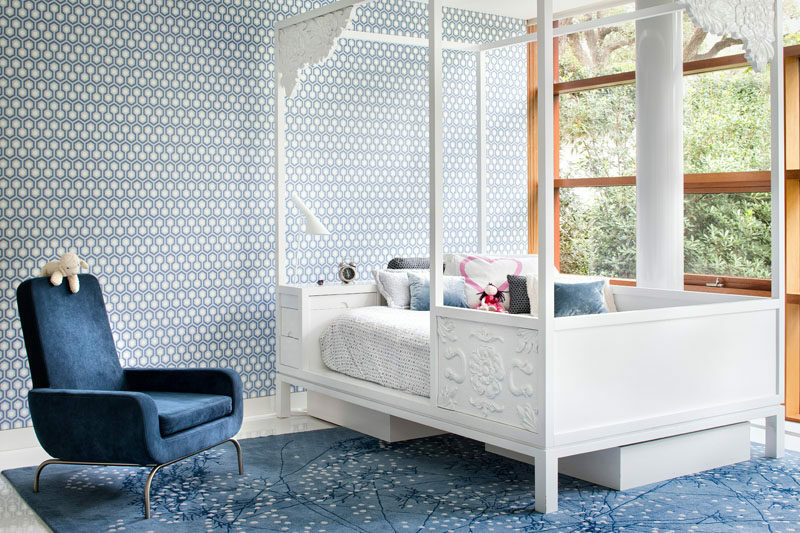 Playful patterned wallpaper covers the wall in this children’s bedroom. Industrial-looking stairs made from steel connect the various levels of the home. 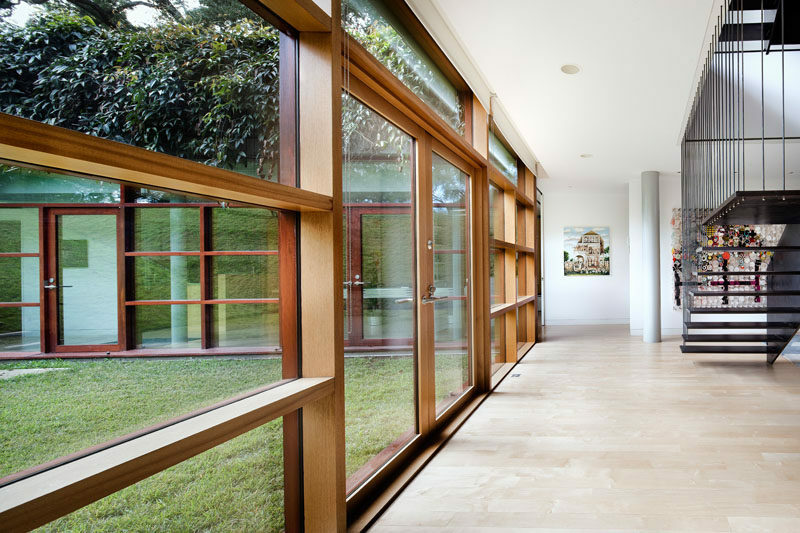 On the lower level of the home, wood frames surround the windows and doors. 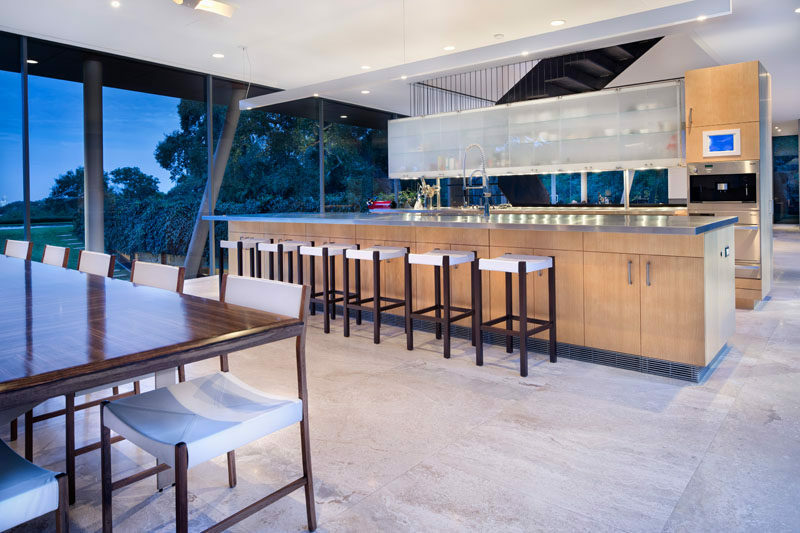 There’s a full kitchen with a built-in dining table between two steel supports. 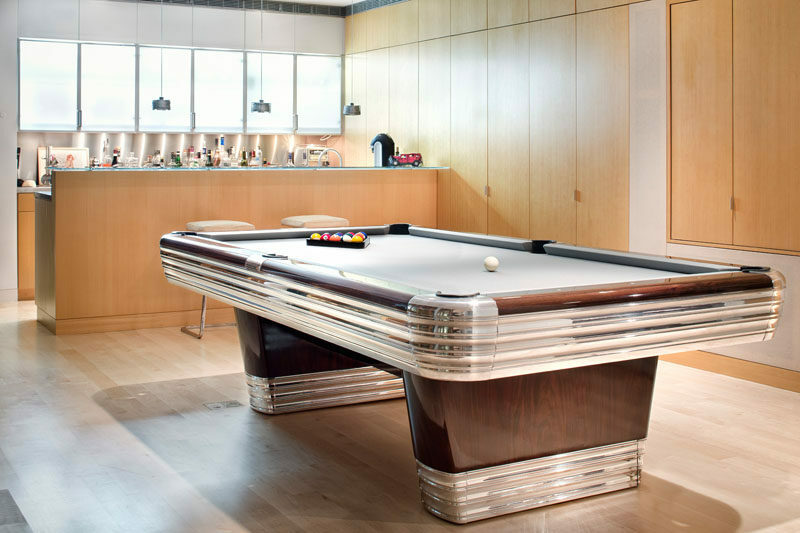 If you’re in the mood to play games, there’s a pool table and bar. 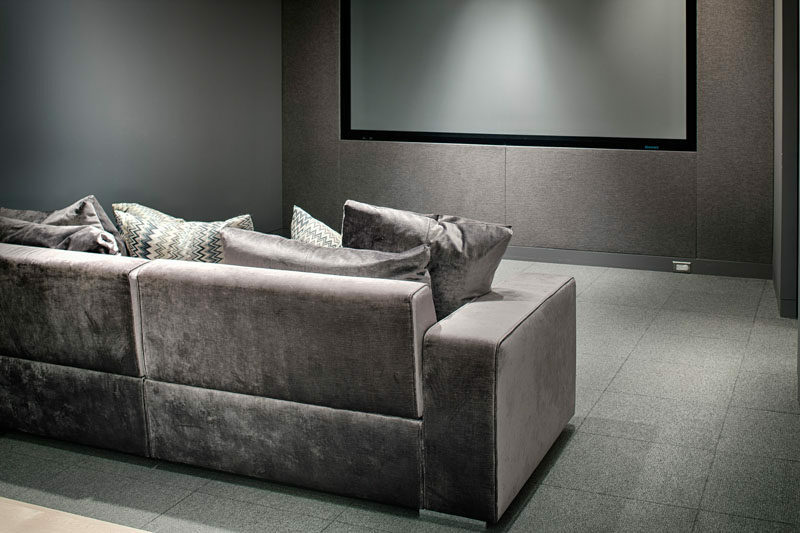 There’s a home theater with a calming grey color palette. 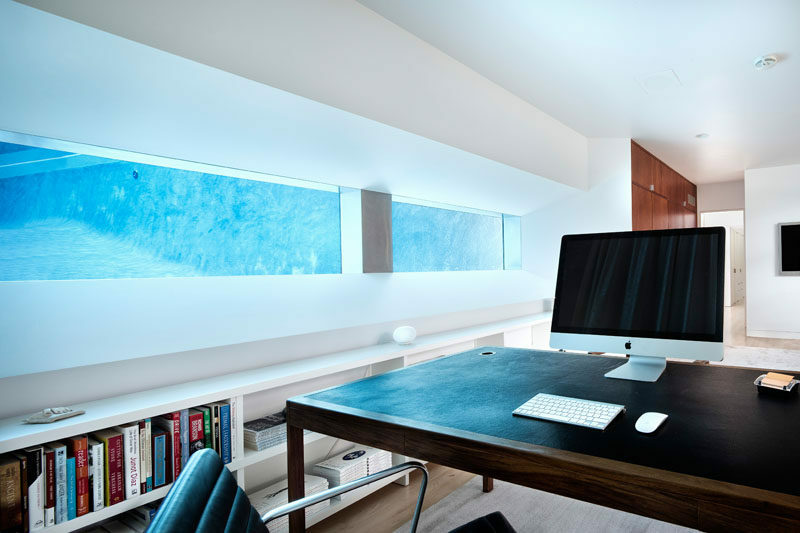 As some of the spaces in the lower level are hidden under the grassy areas, they provide the perfect opportunity for some unique views, like from the office that has a view of the pool from within the water. 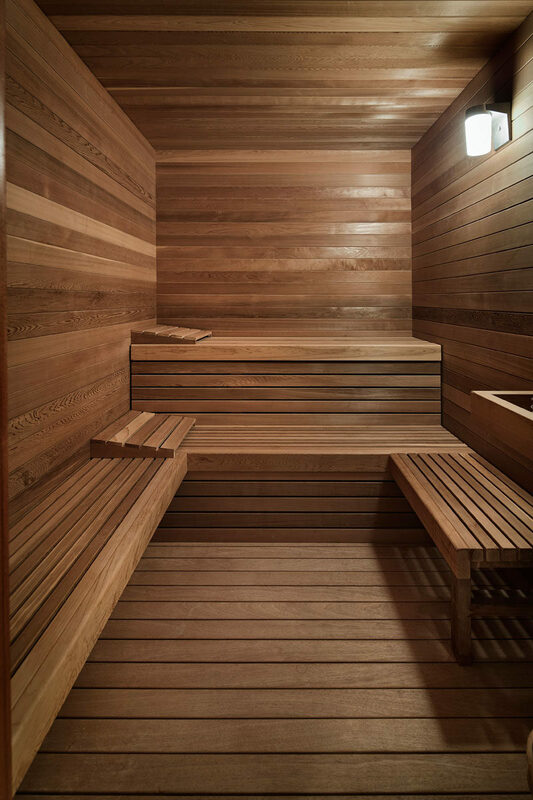 A wood covered sauna has been designed with different levels for sitting. 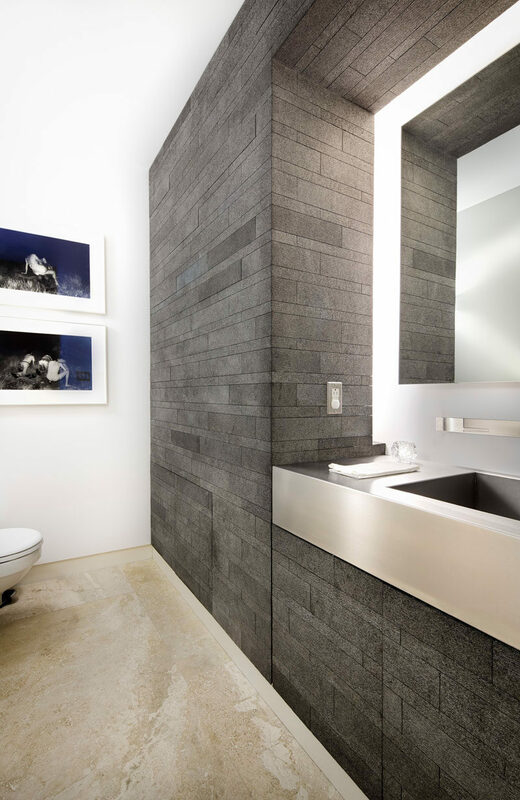 Here’s a look at one of the bathrooms in the home that features built-in lighting around the mirror. 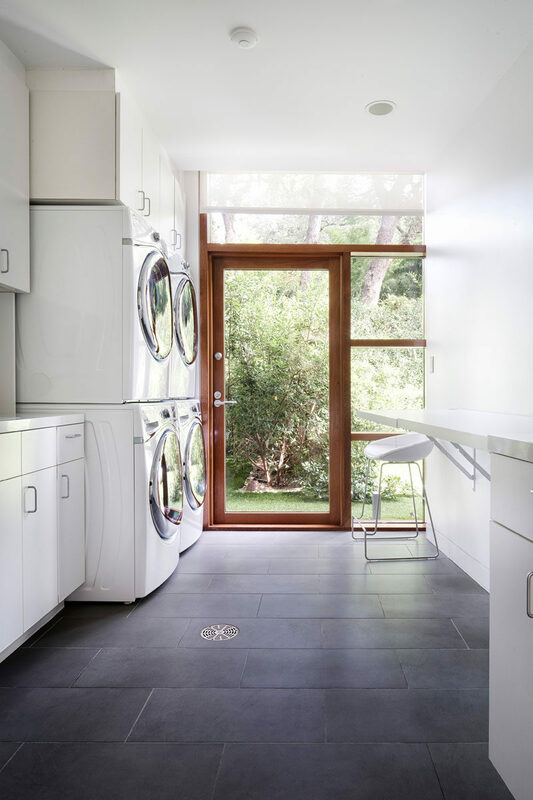 As the home is quite large and can handle plenty of visitors (there’s a separate guest house too), the laundry room has been designed to easily clean and organize lots of clothes. 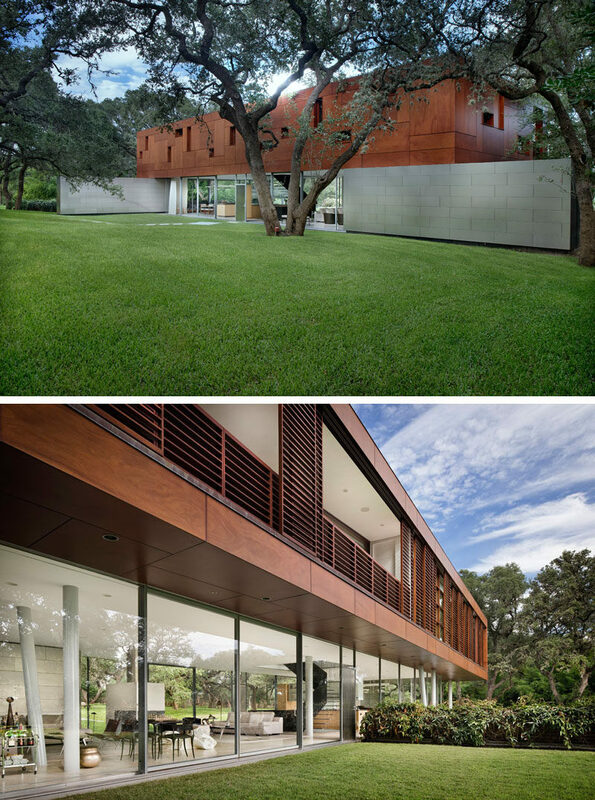 You can find out more about this listing, here, through Luxury Portfolio International.